And running in the yard with my brothers and sisters, skinning knees, poking snakes, pulling briars from our clothes, dust on our lips, snow falling and blanketing the world in silence. What Does Sustainable Eating Require? There is no greater tasting fish, than the one you caught. So what does sustainable eating require? Why hunting, gardening, foraging and angling of course! There are no hard and fast rules to it, but most would agree you should, eat local (what’s in season), leave the area as you found it, don’t take flowering plants, spawning fish, don’t take everything (only what you plan to eat that day or to preserve), and generally…don’t tell anyone else exactly where you got it (the effort to find the resource keeps the resource intact). Australian photographer, Rohan Anderson not only takes the most beautiful photos of his small family garden outside Victoria, he’s a supremely, elegantly simple cook. To see his food, is to to taste it, even in the picture, you can imagine the ingredient’s flavors individually dancing in your mouth. Now is a fascinating time to read his blog, while we’re in high-summer, its Australia’s winter. Minneapolis-based Daniel Klein is a passionate chef and filmmaker. His online weekly documentary series, The Perennial Plate, takes a look at the food we eat, from a sustainable point of view. Season One took place over a calendar year in Minnesota where very Monday for 52 weeks, Klein and cameragirl Mirra Fine released short films about good food. Season Two follows Klein and Mirra across the US. Klein has worked in some of the world’s best kitchens (Heston Blumenthal’s The Fat Duck, Thomas Keller’s Bouchon, and Tom Colicchio’s Craft). There are more than 60 episodes now you can view on the blog. Sacramento-based food writer Hank Shaw has just launched a great book called Hunt, Gather, Cook, Finding the Forgotten Feast. His blog has chronicled years of foraging and hunting, as well as the amazing recipes he’s developed or altered to make the most out of his ingredients. 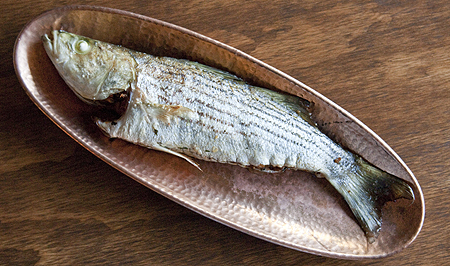 Just in time to catch the tail end of the striper run and any schoolies of legal limit, check out his recipe for Mushroom Stuffed Striped Bass. I’ll be taking the wife to Public this September where he’ll be cooking! Salt Fresh & Field isn’t a blog, but a new tv series in development by Chad Brealy. In the vein of Ben Sargent’s show, Hook, Line & Dinner, Brealy, is a Vancouver resident and ex-fly fishing guide, who has recently taken up the pen and camera to tell the tale of area foragers. A visually compelling and energetic, fresh take on food tv, the teaser just about says it all, that our food, and how we eat, is a story unto itself. Read more about Brealy in this feature about him in Vancouver Magazine. I hope his show gets picked-up and takes off! Thanks to Logcabineer for spotting this one. I’ve only been night fishing a couple of times, once when I was a teen and recently with a Gowanus Noodler on a small lake near the Beaverkill where we were learning to fly fish at the Wulff School. It was memorable for the complete sense of isolation and quiet. There was a mist over the lake and the only sound was of the water rushing over a small dam, and a steady drizzle. We didn’t catch anything, but I then we were unprepared a bit punch-drunk from a long day of class. With a moon up and sober, its a different story, you can see a long way and experience the landscape differently. You can hear sounds more acutely. You can catch a “tailing” fish in the gleam of the moonlight if you’re lucky. 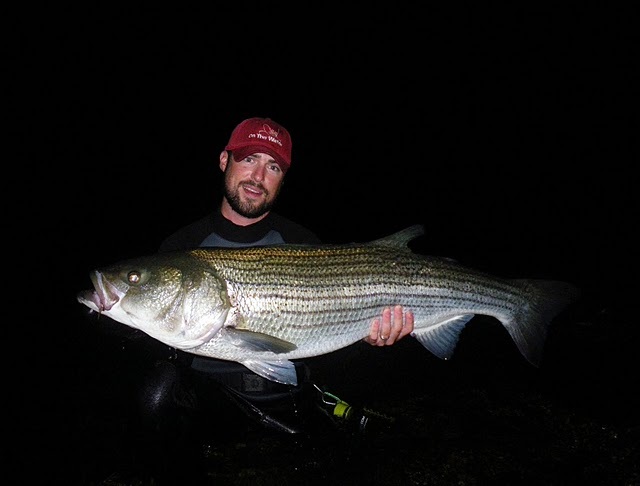 And if you’re really lucky–you can take the biggest fish of your life, as Kieran, the Connecticut Yankee, did surfcasting a few nights ago. Read his post on his blog here. I’ve been considering doing some night surfcasting or trout fishing with the said-same Gowanus Noodler who is quiet the striper fisherman by day, but I feel I’ve got some studying to do first. There’s a couple of books I’ll need to read. The late Jim Bashline’s tome, Night Fishing for Trout: The Final Frontier, is considered an essential read and can be applied broadly. Perhaps more famous and entertaining, is Night Tides, The Striper Fishing Legend of Billy the Greek, by Michael Cinquemani. Unfortunately, I’m on the tail end of the Striper run here in NY, though there are reports of stripers in Cape Cod now. Would I settle for a blue? Hell yeah, they are delicious when fresh-grilled. Need further inspiration to wade out into the inky blackness to fish for a lunker? I came across this branded short documentary for Honda by ad agency Wieden & Kennedy in London. Last summer some friends of ours took my wife and I sailing out of Oyster Bay and in the Long Island Sound. I was thrilled they let me steer quite a bit. There’s nothing quite like the feeling your going to tip (or heel) the yacht over as you steer into a strong wind. We sailed, we took a dip in the bay, we fished, and we ate oysters. On our first visit we spotted Billy Joel with family in-tow as they embarked on his completely restored vintage “downeaster” or oyster boat. 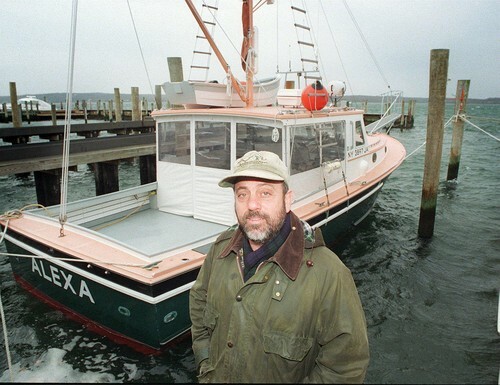 Billy Joel is, in fact, a serious small-scale fishermen advocate and his song the Downeaster Alexa captures his feelings and activism beautifully. With all that in mind, I went back to Oyster Bay this weekend to hit the beach at Centre Island. The beach was serene, quiet–the exact opposite of the thousands jam-packed together at Jones Beach that day. The water was cool and refreshing, a bit stained as the sound always tends to be. The cool thing about Centre Island is that you can swim in the sound, or walk a few hundred yards and swim in the Bay. Both have beaches that guarantee you beautiful views and peace. The surrounding area is quite tawny with mansions and quaint villages. After a spot of rain and no luck surfcasting plugs and bucktails, we hit the town of Oyster Bay to grab drinks and seafood at Canterbury’s. 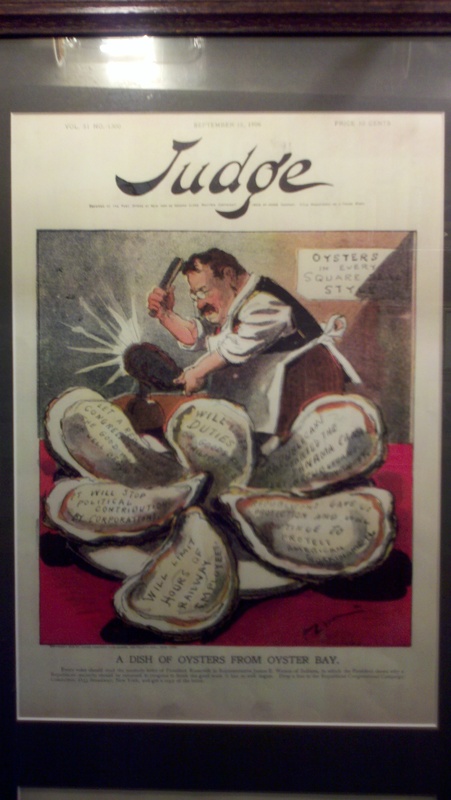 Canterbury’s is fixated on two things–oysters, ‘natch, and Teddy Roosevelt, a one-time resident. The malpeques, kumamotos and pine islands were bright, briny and fresh. 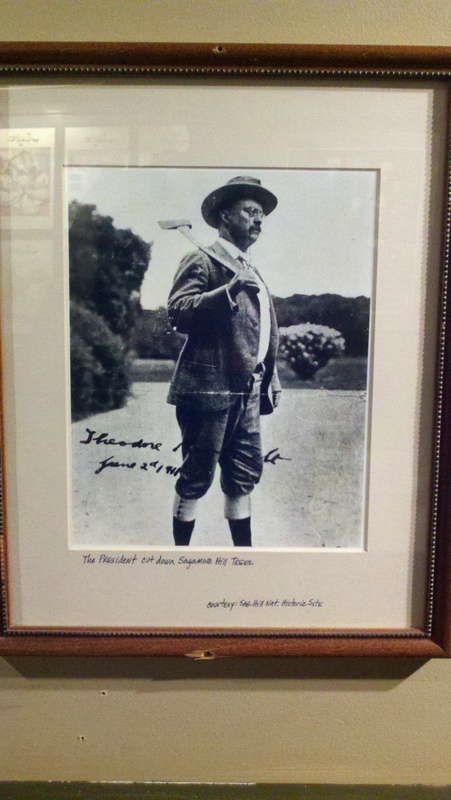 Pictures of the great president and outdoorsman, Teddy Roosevelt were carefully curated. Some celebrated and “satirized” his time in Oyster Bay. 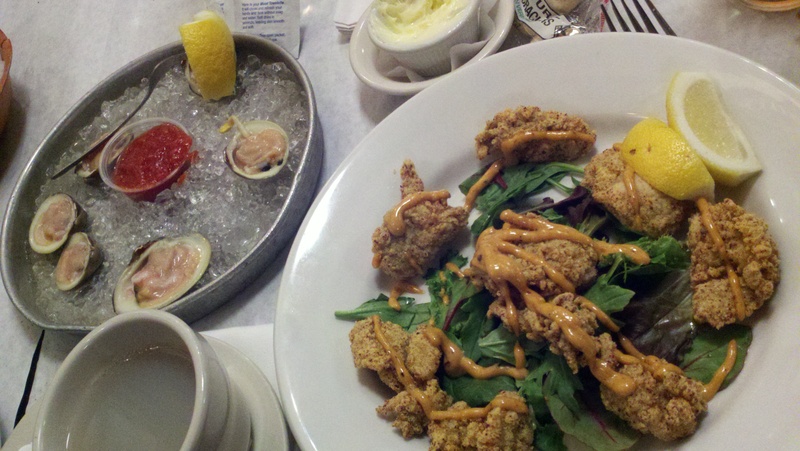 I didn’t take to the clams on the halfshell, but my fried oysters were perfect. 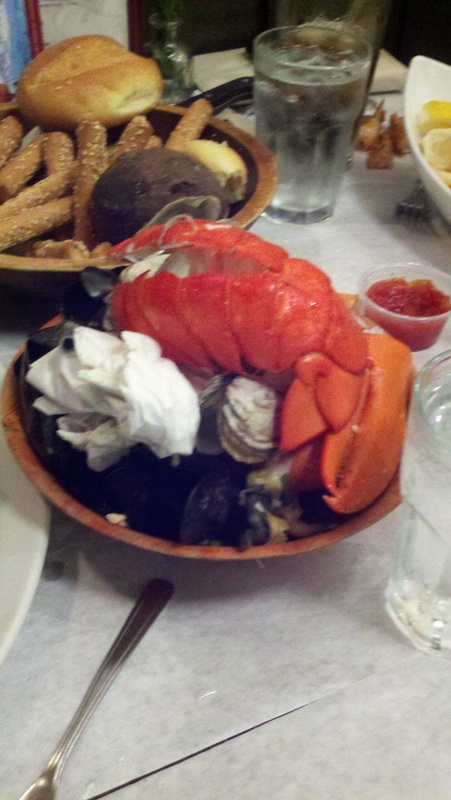 My friend has the New England clambake which came with tons of steamers and oysters…it was carnage. 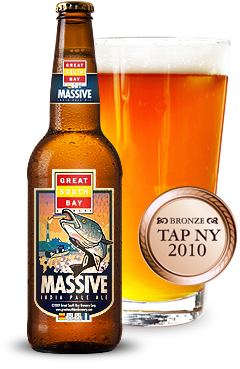 We dithered over pints of Great South Bay Massive IPA. 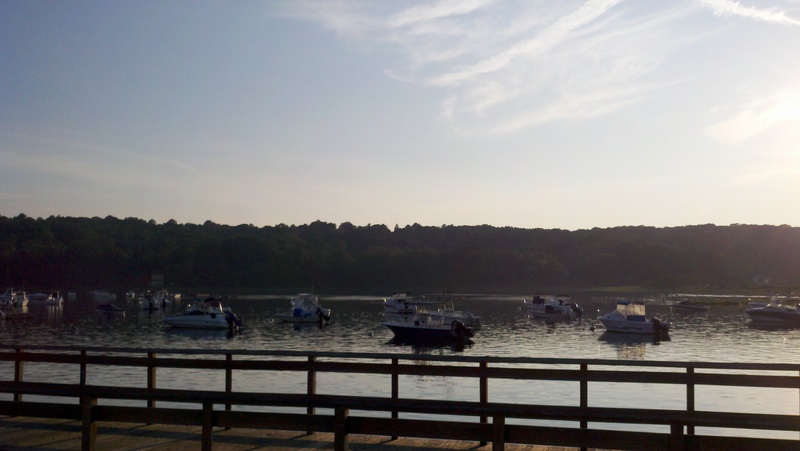 Afterwards we ended up at a pier on Cold Spring Harbor throwing sandworms, watching the sailboats come in and the night anglers heading out as the sun set over the bay. Couldn’t ask for a more perfect perfect summer day. I’ve long-wanted to fish the Catskills, so when our friends invited us up to their Palenville summer house for a long weekend, I couldn’t resist. 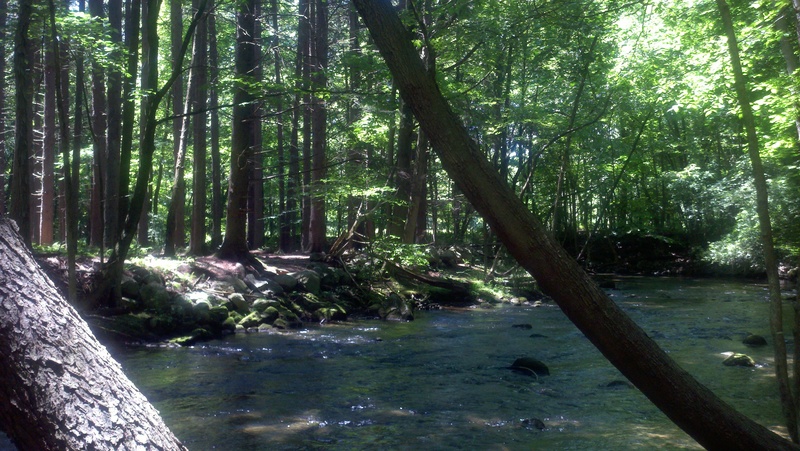 We planned to fish the Esopus Creek, North South and Colgate lakes. Three days of fishing were punctuated by delicious meals of fresh-from-the garden vegetables and local produce, as well as a fine meal at Miss Lucy’s Kitchen in Saugerties. Icy beverages included Pimm’s Cups and my friends perfect Mint Juleps with chocolate mint from his own garden. Click on the pictures below to see more at my Tumblr blog, a deadbait. On Day One we were up early on the river near Five Arches bridge. The water level was a wadeable height, but we had a bluebird sky which made the fishing a bit tough. A weight-forward or sinking line would have done me good. My friend caught very sizable Smallies on a Mepps and Pather Martins, spin fishing to bass waiting behind rocks to ambush prey. There wasn’t much hope for dry flies and close-in imitation nymphs were ignored in the slightly chalky pocket water. Spotted a bald eagle. Later, at the riffle above Chimney Hole, I was to discover that the browns were deep and looking for flash. Beadhead nymphs were quickly rewarded on the tail-outs of big chutes, finally! The entire day we spotted only three other anglers, it was delightfully peaceful and exhilarating to be on such big water after months of small stream fishing in the Croton Watershed. Day Two took us back out for a half-day stretch just below Phoenicia behind the Emerson Hotel. 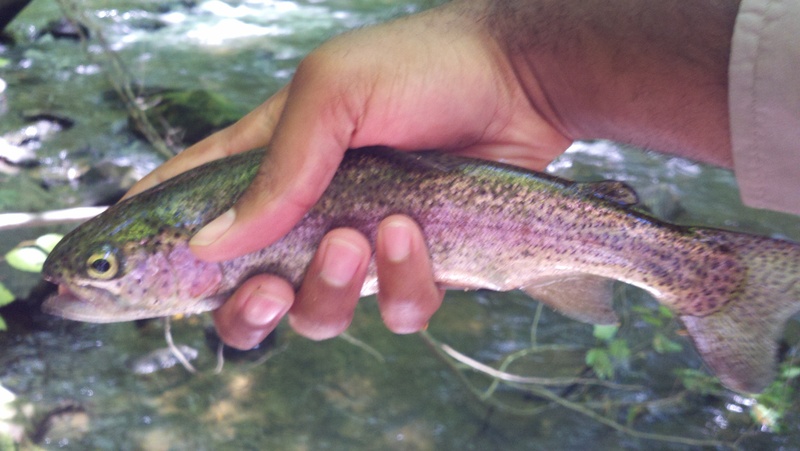 With plenty of laydowns on the cut-bank side I hooked into a brown on a bugger and later a brookie on the flats. We spotted two enormous eagles with trout in their claws. One trout was clearly a lunker. You can’t beat mother nature at her own game right? A nymph in Rainbow Run got me a… rainbow…but alas he popped off before I could net him. My friend landed two more smallies at the bottom of Rainbow Run in the wash, but having lost so many spinners, we decided to call it a day. After lunch in Woodstock (satisfying burgers and beer), we returned home for an afternoon siesta. We made a delicious meal that evening: cast-iron seared scallops, grilled tilapia, snowpea and almond salad, washed down with a great Hawke’s Bay sauvignon blanc called The Supernatural. Later, s’mores over the fire in the evening and whisky on the rocks lead us to deep sleep. Day Three took us to North South lake where we rented a rowboat and edged along the weedline hunting for bass. The weeds were up high and the bass were slow to bite, but managed one decent one and my friend, a pickerel, while the girls laid-out on the beach. After a lazy slow dinner, we hit the road home late. Its incredible that such remoteness can be found only two and a half short hours away from New York. On the trip, I found Jim Capossela’s book “Good Fishing in the Catskills” invaluable for info on the Esopus. If you get to the Catskills this summer, be sure to pick up some local smoked trout–you won’t regret it on a bit of toast with cream cheese or over a fresh salad. …I’ve only been to the beach once this summer. Will have to correct that. Sunday early. Long Beach (short drive). Bagels in the morning, steamers for lunch, grilled bluefish for dinner, Italian ice for dessert. Who’s with me? Jake Davis and his Test Shots are legendary. Here’s one he did for K-Swiss new California Running line by Brendon Babenzien at Union. now do you want to go to the beach? At the moment, I am in an intense period of character development. I realized early on that I would have to give every character at least two drafts of development to avoid cliches. As each character supports the plot, they are like jigsaw pieces that you fit into a puzzle. Ever the reductionist, I constantly ask myself, “why do they exist?” They exist to serve the plot…if not, they are useless and are cut, or their roles are dramatically reduced. To avoid cliches, I have to embrace each character, and learn to love them a little, and hate them a little. Case in point, how do you love a slaveholder from antebellum Charleston? You make his story a bootstrap one, and you give him a fatal flaw that you know damn well you have too… afterall, people are people. How do you hate your protagonist just alittle, just enough to jam him up and put him in a chokehold that will drive the story forward? You give him a characteristic about yourself you wish you could change…maybe you make him a little lazy, so that it takes an asswhupping to get him moving again. Either way, every character has to be informed by research, research, research. Frankly, I’m tired of the research and reading. I just want to write! Yet I know putting the time in is key. So what’s informing the development right now? 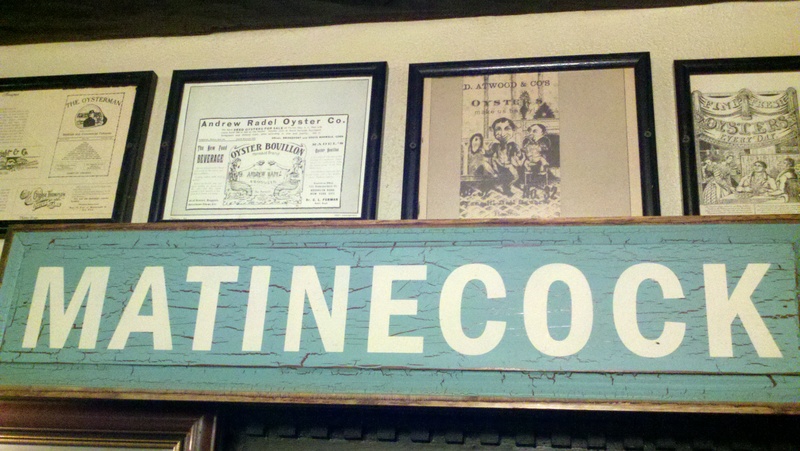 Hit the East Branch Croton last week and the Titicus Outlet this weekend. Despite the high temperatures, the valleys of both rivers were quite cool and pleasant. 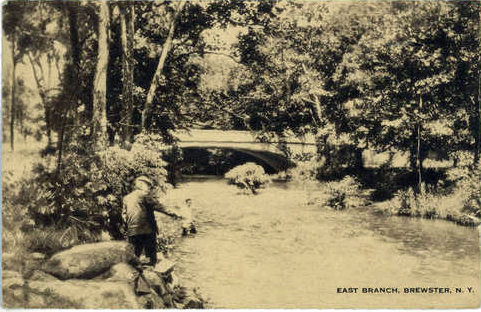 The East Branch is a tailwater and perhaps the most famous of Westchester rivers, designated a Special Trout Fishing area with strict catch-and-release rules. It is stocked but has a rewarding wild brown trout population. EBR has some pretty famous holes, “the Bathtub” and “Trestle Pool,” which are quite unique, as you’re surrounded by manmade works and engineering, but standing in a river hundreds of years old. Its an excellent river to challenge yourself as the trout are incredibly smart, many having been caught before and under a fair bit of regular pressure. EBR has long been an angler’s favorite. At the “Trestle Pool” named for the railroad trestle high above it, I spotted several trout rising steadily to something in the film. There was a two-pounder with them but they were out of reach of 75% of casts due to a large overhanging tree. Determined, I walked up and down the bank for thirty minutes. My friend and fellow Gowanus Noodler joined me, but couldn’t see a way to cast in, as he munched on his sandwich. Finally, I knew what to do. I knew the pool was deep, but maybe I could go upstream and slowly wade downstream just enough to dead-drift a fly right down the lane? I eased into the water up to my knees, then hips, then chest and inched along. A large sunken boulder made a good place to rest and I eased the line out. No strikes, no takes. I tied on several more flies. By now, I was pretty sure I had spooked them off, but no, there was another rise, and another immediately to the right of me. I had been in the freezing cold water so quietly for so long that the trout had moved up closer to me. Finally, I remembered the simple and best lesson on Westchester streams, smaller is better. I tied on the smallest fly, a 22 black midge. It floated in the film, and had immediate rises, a couple refusals from the nearest fish. They were on to me. Yet…maybe there was a trout still hanging back under that tree? I let the line out, and out, and out until I felt the slightest, tiniest “pressure” touch down on the line, and then came the tell-tale swirl. I set the hook and landed a nice 1-pound brown that fought me all the way to the net. I went to pull out my camera phone to snap a pic and realized it was under water in my chest pack. Yep, dead as a doornail. 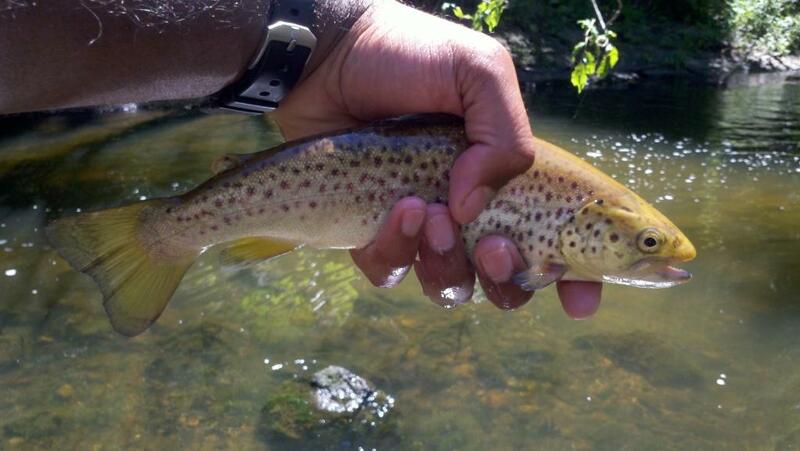 Fortunately, I had got a pic of an earlier brown up in the “bathtub” that I had taken on a muddler minnow. Titicus Outlet is also a tailwater (a short meadow stream flowing from the Titicus Dam) and has perfectly cool non-turbid water for trout. Titicus is blessed with little pressure, and beautiful groves of hardwoods, Norway Spruces and Hemlocks. The meadown reminds me of the pacific northwest a bit. While not a “special area,” this river gets big trout who swim up from the Muscoot Reservoir to spawn and +20″ have been caught close to the dam in the deepest pools. My trip this weekend to Titicus with another Gowanus Noodler was very relaxing but unfortunately familiar. We’d fished many times together with him almost always getting skunked. This time he had two trout on while nymphing, but couldn’t bring them to the net, he’s getting so close! And no doubt will land a big’un for his perseverance. I squeaked out a nice ‘bow on a green “flashback” caddis nymph near a fallen branch on the water. Bow’s love trees! I’ve taken great pleasure in learning about the Westchester rivers first-hand and perhaps at the worst possible time (in the height of summer, but you have to start somewhere). There is a vibrant and wide-ranging group of fly fishers who can be tight-lipped about the rivers, and understandably so. We nod and chit chat, but details are spare. You have to earn a longer conversation…and they know fishing is tough in Westchester whether you’re a veteran or a beginner like me. An interesting resource I’ve come across lately though has proved useful. 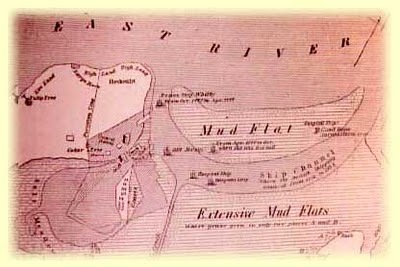 Google has archived Field & Stream magazine and articles about several of Westchester’s rivers show up in a simple search. 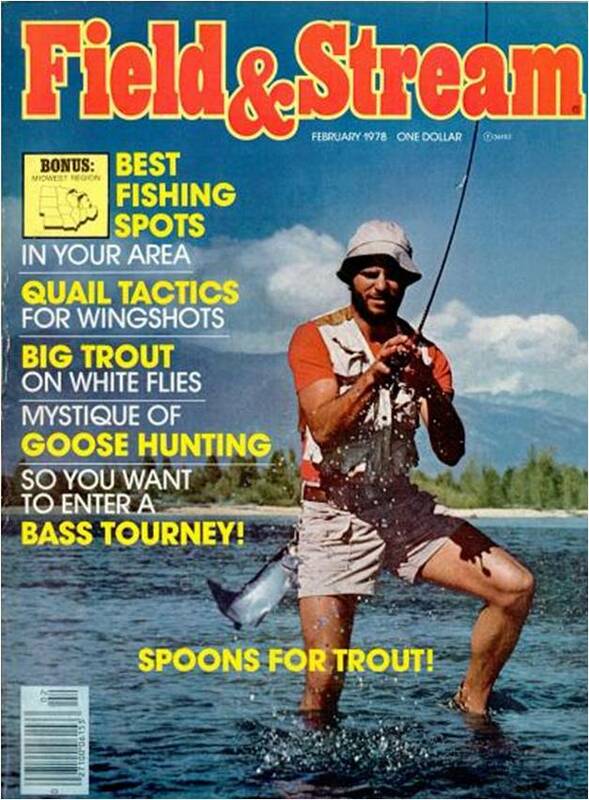 Fred McKinley’s article, “the Cool Trout of August” is excellent reading. McKinley was a frequent contributor to F&S in the 70s and fly fished the Westchester rivers extensively. Yes! Putnam’s has started a Happy Hour! With $4 select beers. 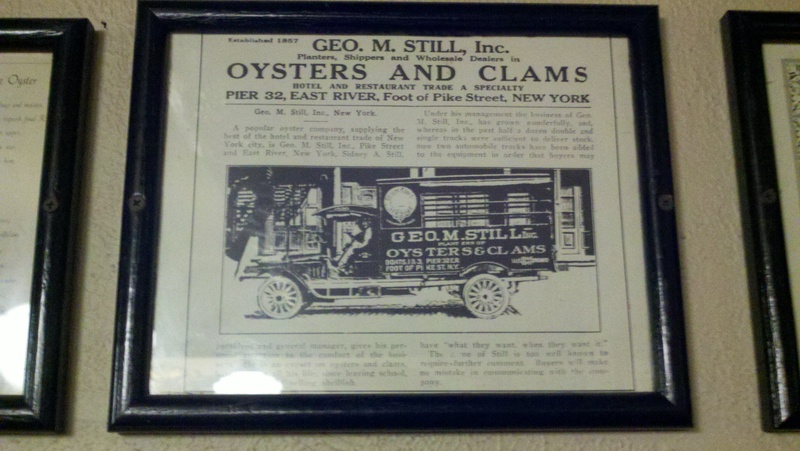 Yesterday they had Oysters on special for Irene, $1.50 a piece. Well done. DO try the Putnam’s Pilsener. This place keeps getting better and better. 7 out of 10 now. UPDATE *** I went with the missus on grand opening week and they didn’t have the kinks worked out. The waitress and host Connor were gracious though and comped our meal due to a kitchen malfunction that had us waiting more than an hour. Their mint julep was PERFECT, the lobster roll (OK…it ain’t no Red Hook Lobster Pound roll that’s fo’sho, and the burger was acceptable pub fair). Oysters check, beer specials…er….no check. YELP has the latest reviews. I’ll wait a few months and give it another shot, but it’s about a 6 out of 10 right now. So I live about fifty feet from a new restaurant going in at the corner of Clinton and Myrtle Avenue. The wood panels are finally down and everyone’s buzzing about the new pub. 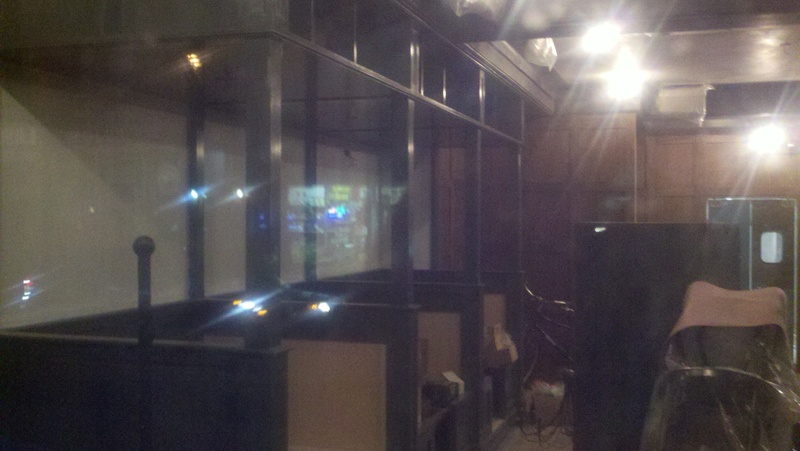 So after a few pints at my local, Rope, my six-foot tall friend and I peered in the windows and got a sneak peak. 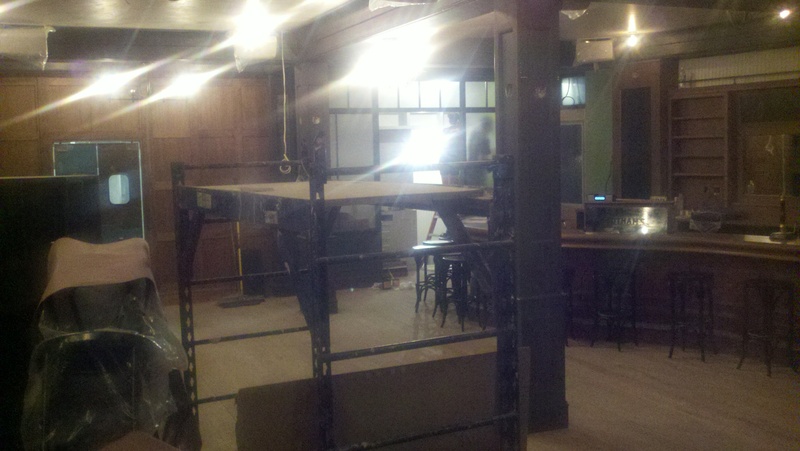 We think its called Putnam’s Bar and Cookery (UPDATE – it’s Putnam’s Pub and Cooker) or something, according to a sign. The pressed tin walls and ceiling, sumptuous-looking enclosed banquets, edison-style light bulbs give it away a bit. While I have no idea of the menu, I’m hoping it’ll be along the lines of nearby Dean Street Cafe, No. 7 or Roman’s, excellent pub fare with the odd oyster or two. I hope the this post will serve as a polite plea to the owners and managers of Putnam’s–please, consider having a decent happy hour and specials–a buy-back wouldn’t hurt either. Remember, this is Clinton Hill, not LES. Pay attention to your neighboring pubs–most have good happy hours to accommodate the mixed nature of this neighborhood (Pratt students, middle-class bohemians, and blue-collar folk with actors and novelists sprinkled-in). Don’t worry about fancy cocktails, focus on local beers and a good wine list. Hell, you don’t even need a back yard, and the sidewalk is wide enough to fit a table or two. Bear in mind these grainy mobile pictures don’t do ANY justice to what the owners probably have in mind. I spotted beautiful wood paneling inside, a curved bar, and outside the windows have beautiful transoms and leaded wavy glass as if they’d been there forever. Ever since leaving Williamsburg and my favorite pre-prohibition era saloons behind (Dressler, Walter Foods, Five Leaves and Rye), I’ve been pining for a good all around pub (with oysters-hint-hint AGAIN). I wish I could say the Brooklyn Public House on Dekalb does it for me–but its kinda soul-less and the menu is all over the place, though the Public House DID learn to provide a decent happy hour. I look forward to giving Putnam’s a try–if they put half the effort of the design into the menu and staffing, they’ll create something quite special and enrich this increasingly vibrant stretch of Myrtle Ave. So I’m waiting for my new American made Filson Guide shirt to arrive in anticipation already of fall fly fishing in cooler weather. I threw in a shelter cloth cap while I was at it, then tooled over to the Filson page and lo and behold–Filson and Vans did a collabo! A sweet pair of kicks using the Filson rugged twill and signature chocolate bridal leather and a rucksack. I’ve never been a vans fan, but may have to consider them now… Damn, I’m always the last to know. I’ve covered the Levis X Filson collabo before, I shared a trailer for the documentary about back country fire fighters sponsored by the both venerable outfitters that originally premiered on VBS.tv (Vice Magazine). Here is the full short doc from the VBS.tv Americana series: “The Oregon Fire Lines” and tells the story of the firefighters of the Grayback Forestry Company. Unfortunately, Vice sent along a wussy hipster as the host and they don’t really dig-in, just sort of stay on the surface level. Guess thats fashion. Its interesting that the fire company is composed of outdoorsmen who didn’t quite fit into indoor lives…enjoy.